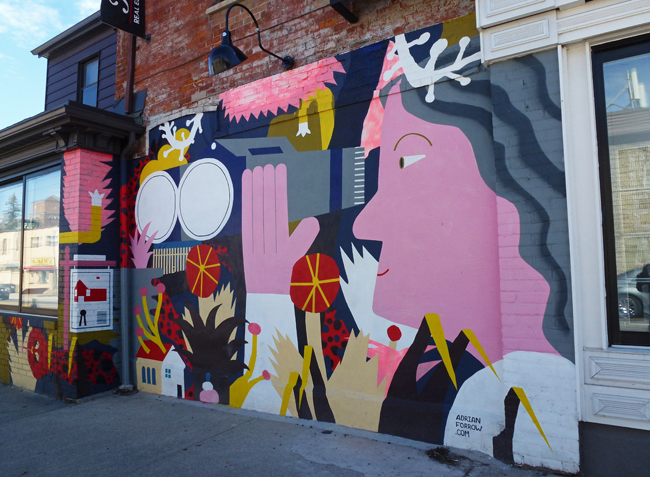 I spotted this mural on the side of a real estate office on Harbord St and I wonder if the binoculars refer to the agents always on the lookout for homes. The artist for this one is Adrian Forrow who is apparently an artist, illustrator, and also an instructor at the Ontario College of Art and Design. I like his style. You may be right about the binoculars. They must have some meaning as they are the essence of the mural. The pink skin is rather off-putting, though. It's like she's been in the sun a little too long. :) Nice find, Pat. Wishing you a great week ahead! This mural certainly adds a splash of color to the neighborhood. Does not seem to have an obvious link to real estate, but it does keep the building from being boring. I like the style too. I wonder if someone is looking through the other half of the binoculars. Very colourful mural... and no tags. Oh I like the style too! The colors are wonderful as well. So, Ms. Artist, when are you going to come out of the shadows and show us some of your own artwork?